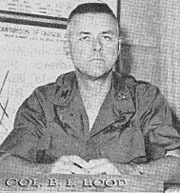 CU CHI - COL Burton F. Hood, Jr., a 1943 graduate of the U.S. Military Academy, has succeeded COL Jasper J. Wilson as the 25th Inf Div Chief of Staff. COL Wilson has been reassigned as the deputy post commander at Fort Huachuca, Ariz. COL Hood came to the Tropic Lightning Division from an assignment in Hawaii as the secretary to the general staff at headquarters, U.S. Army, Pacific. After receiving his commission as a second lieutenant of infantry, he was assigned to the European Theater of Operations and participated in four campaigns with the 95th Inf Div. This is the colonel's second tour of duty in Vietnam, he served previously with MAAG, Vietnam in 1956-1957. During that tour he was the advisor to the ARVN Airborne Group at Tan Son Nhut Air Base and conducted many air assaults into what is now the present Cu Chi base camp area. Subsequently his CONUS assignments included positions in the office of the Deputy Chief of Staff, Operation, DA and as the assistant deputy chief for personnel and administration of the United States Military Academy at West Point. The colonel's military education includes numerous branch and specialty schools plus graduation from the U.S. Army Command and General Staff College at Fort Leavenworth, Kan., and the Industrial College of the Armed Forces at Fort McNair, Washington, D.C. He received an MBA degree in business administration from the University of Alabama in 1953. Among his decorations the colonel wears the Bronze Star Medal with one Oak Leaf Cluster, the Army Commendation Medal with one Oak Leaf Cluster and the Combat Infantryman's Badge. His wife, Marcia, and two sons, Thomas and William, currently reside in Hawaii while their oldest son, Daniel, is in his first year at The Citadel in Charleston, S.C. Their only daughter, Kathryn, is married to CPT Leigh Fairbank, a former member of the 3rd Bde, 25th Div. Col Hood's mother, Mrs. E.S. Lorentz, lives in Mahtomedi, Minn.
A 25th Inf Div radiotelephone operator has been recommended for a valor award for voluntarily rescuing four wounded men pinned down and stranded by heavy Viet Cong machine gun fire. SP4 Ray D. McGuire, son of Mr. and Mrs. Carl McGuire of Frankfurt, Ky., saved the men during an action in Hoc Mon, a suburb of Saigon, during the Viet Cong Tet offensive. McGuire is a member of the 2nd Bde's Charlie Co, 1st Bn, 27th Inf " Wolfhounds." The action began when his company conducted a helicopter assault into an enemy-occupied landing zone to reinforce another heavily engaged company. After being inserted into the landing zone five Wolfhounds crawled behind a rice paddy dike for protection, four were wounded and the fifth killed. Meanwhile, according to McGuire, the remainder of the company landed nearby and began moving towards the five stranded Wolfhounds. Within minutes, he said, the company came to a standstill in waist deep mud as the Viet Cong poured rocket, automatic weapons and machine gun fire into their assault line. "The company commander sent two men from the first platoon," McGuire explained, "but they came back and said they couldn't find them. "I asked for a chopper to drop smoke on their location, which he did. I asked the CO if I could go down there. He hesitated at first, but then let me go." McGuire then began a 150-meter crawl through muddy rice paddies while enemy fire cracked overhead. 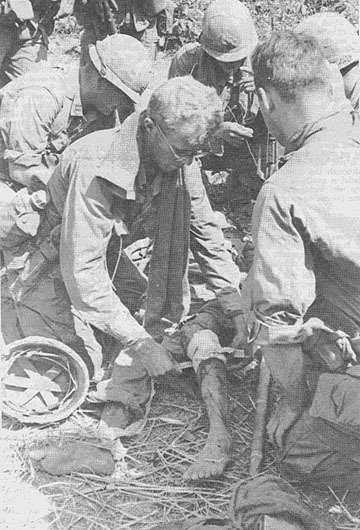 "When I got to the wounded, I had to go over the dike," he explained. "As I rolled over it, shots hit right next to me. I rolled into the water on the side the wounded men were on. I started hollering at them, but they just lay there. They did not want to move. "One man said he was a medic, but he was in a daze. I talked him into going over the dike. Then I had to convince him to help me get the other wounded over the dike. We eventually got all three across like that." At that point, McGuire called for support from armed helicopters, which soon blazed away at the enemy positions with their "mini-guns." Starting to drag the men back to safety, the RTO came upon something he thought was a dud mortar round. He picked it up and tossed it over the dike. "When I came to the last man he was dead. I pulled him along a ditch, but it was too difficult." He returned to the wounded, eventually leading them back to friendly lines. Medical evacuation choppers picked them up and delivered them to an evacuation hospital. McGuire joined the Army in Aug 1965. Since his arrival in Vietnam Oct 1967 he has been awarded the Combat Infantryman's badge and the purple heart. 3RD BDE - Limitless are the stories revolving about people who fail to get the word, but here is one with a novel twist. Several days ago fire support base Burt, the site of the New Year's Day battle of Soui Cut near the Cambodian border, was closed down and the artillery elements, escorted by the 2nd Bn (Mech), 22nd Inf, 25th Inf Div, moved out. However, the Viet Cong, apparently unaware that the position was empty, continued sporadic mortar attacks on the support base, concluding with a spectacular 150 to 200 round barrage the evening after everyone had gone, and observed only by a few passing spotter planes. The sole conclusion is that Charlie definitely did not get the word. Have you wondered about the Vietnam Service and the Vietnam Campaign medals? The Service medal is an American award which shows service in Vietnam whereas the campaign medal is a Vietnamese award given to those who serve in the country for six months. The Vietnam Campaign Medal (VCM) is authorized by the Vietnamese Government for each member of the U.S. Forces who has served at least six months in the country: There are two small devices designed for the medal (or ribbon), one which is marked "49-54" for those who served six months in RVN between 8 Mar 49 and 20 Jul 54, and another marked "60-" for those who have served six months in RVN since 1 Jan 60. Recommendations are not required for either of these two medals. They are to be recorded in each member's personnel records as that member qualifies for the award. As for wearing the awards, remember that you qualified for the Vietnam Service Medal as soon as you arrived in RVN while for the Vietnam Campaign Medal you qualify as soon as you have completed six months in the country. Another point to know is that the American award, the Vietnam Service Medal, is an item of issue to be given to each member. This is not true of the Vietnamese government award although the ribbon only for the Vietnam Campaign Medal is available through Army supply channels. Anyone who wants the entire medal must secure it from some private or commercial source. Another subject, have you memorized your social security account number (SSAN) yet? The day when it will take the place of your present service number has not yet been announced; but it is coming, and already official orders and records must contain the member's SSAN in addition to his service number. If you have particular questions which you would like to ask regarding any of the services which the AG Section provides, please feel free to call the section or write a letter to the Adjutant General, HQ, 25th Inf Div, APO San Francisco 96225. Those of general interest will be answered in this column. Those of specific interest to an individual will be answered by a call or a letter to the individual. WASHINGTON - Combat soldiers recuperating at hospitals in the U.S. - including Hawaii and Alaska - now may enjoy government funded travel home for convalescent leave. A provision, authorizing the privilege for men wounded or injured by hostile fire and returned to the U.S. for recuperation, was included in the military pay bill signed by the President late last year. After putting together some of the necessary medical and finance details, the Army now has sent a message (DA 850009) telling the field how to use the new sick leave travel deal. "Members are entitled to travel and transportation allowances are authorized," the Army says, "to make one round trip at government expense in connection with illness or injury incurred during each tour of duty involving entitlement to hostile fire pay. "Under current policy, members evacuated to the U.S. are assigned when possible to the medical facility which is nearest the member's wife or family to which he would normally perform travel for the purpose of convalescence. Hospital COs are delegated authority to approve the place selected by the member for convalescent leave travel to be performed in and between the 50 U.S. States and D.C."
The Army is cautioning hospital commanders to require justification for travel to places other than the area of the immediate family to prevent abuse of the privilege. Request for convalescent leave travel outside the U.S. must be approved in Washington. 1ST BDE - Chaplain (MAJ) Alister Anderson of Annapolis, Md., recently became chaplain of the 25th Inf Div's 1st Bde. Chaplain Anderson was previously assigned to the 25th Inf Div Artillery, where he served as chaplain for six months. A 1945 graduate of the U.S. Naval Academy at Annapolis, Md., and an ordained priest in the Episcopal Church, Chaplain Anderson is married and the father of two boys and two girls. A Montagnard in tribal dress stands in defense of his hamlet. 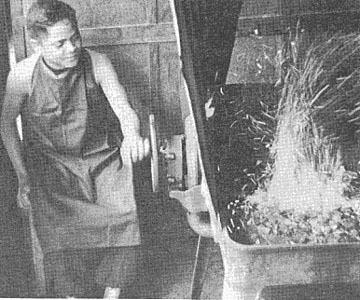 Montagnard Boy Learns A Trade. Most of Vietnam's short, handsome and fine-boned people are ethnic Vietnamese. The overwhelming majority (85 per cent) of Vietnam's 15.5 million inhabitants are farmers. About half of the total population lives in Vietnam's rice land, an area which extends from just north of Saigon to the delta in the south. The precise origin of the ethnic Vietnamese is lost in legend. According to one legend however, the kingdom of the Viets was founded in northern Vietnam nearly 3,000 years before Christ - about the same time as Egyptians were laying the basis of a highly-developed civilization in north Africa. Ancient Chinese accounts tell of Viet states south of China around 500 B.C. The ancestors of the present Vietnamese seem to have descended from a mixture of two distinct Asiatic types - a Sino-Tibetan and early Malay or Indonesian type. Most Vietnamese seem to be physical and cultural descendents of this mingling. About one-seventh of the country's inhabitants are members of minority groups. The largest single minority group, the Chinese, is estimated to number about one million. The overwhelming majority of Vietnam's Chinese live in Cholon, Saigon's twin city. The second largest minority group is primitive highlanders called Montagnards (mountaineers) by the French. Living in isolation in the country's highlands they have maintained separate and complicated tribal customs. The country's approximately one-million Chinese and the 800,000 Montagnards practice social customs quite different from ethnic Vietnamese. The main concern of the Chinese urban community has been commerce. Chinese have been migrating to Vietnam for centuries and during the 1930s when Japan invaded China an estimated 400,000 entered Vietnam from China's southern provinces. The economic impact of the Chinese population has been greatly out of proportion to its numbers. Though they formed a small percentage of the total population, the Chinese controlled 90 per cent of all Vietnamese retail trade in 1956. Chinese control was also great in rice brokerage, lumbering and goods transport. The Chinese have maintained their own schools and they continue to form social and fraternal organizations based upon place of origin in China. They have also produced their own Chinese language newspapers. Montagnards tribes form the second largest minority group. Little more than speculation exists about their origin. Their earliest ancestors are thought to have come to Vietnam in very early times. Later invasions by Mongolian peoples of China drove them into the highlands where some of the invaders intermarried with early Montagnards. Shifting agriculture is the main economic support of the Montagnard group which inhabits Vietnam's central plateau. Shifting agriculture involves clearing land by burning and then cultivating it until it is exhausted - usually after three or four years. 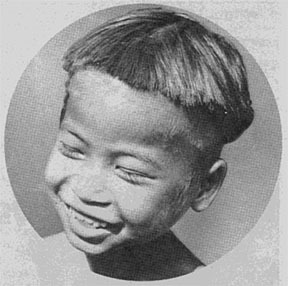 Principal sub-groups of the Montagnards are the Rhades, Jarai and Bahnar tribes. Rhades - about 130,000 of them - live according to a system of clan and tribal divisions consisting of closely related families. Clans are based on a lineage traced through the female side of the family and marriage within a clan is prohibited. About 60,000 Jarai Montagnards live in Pleiku Province. Descent and relationship is reckoned through the female family line and land holding is also based upon maternal lineage. Bahnar tribesmen do not establish clan membership. Families are the most important social unit. Families own and farm land parcels. Two other minority groups in Vietnam - the Khmers and Chams - are distinct from both Vietnamese and Montagnards. Khmers are related to the dominant stock of Cambodia and came under Vietnamese government control during the eighteenth century. Since then, they have been assimilated but remain mostly Cambodian in language and culture. About 35,000 Chams live in scattered villages of the central lowlands and the area northwest of Saigon near the Cambodian border. Descendants of a highly-developed civilization along the coast, they now live in thatched huts. Ruined towers of their once-prosperous cities still stand along the coast as monuments to their lost civilization. Chams disapprove marriage to outsiders and trace their descent and inheritance through the female line. Montagnard Village - Construction Is of Bamboo and Straw. 2ND BDE - Lying in rice paddies and firing everything from World War II machine guns to modern recoilless rifles, South Vietnamese infantrymen are undergoing a rigorous training program sponsored by the 2nd Bde, 25th Inf Div. The Army of the Republic of Vietnam (ARVN) soldiers belong to the 49th Regiment, 25th ARVN Div, centered in Duc Lap, Hau Nghia Province. So far, three of the regiment's four battalions have completed the five-week training course in the rice paddies and forests around Duc Lap. 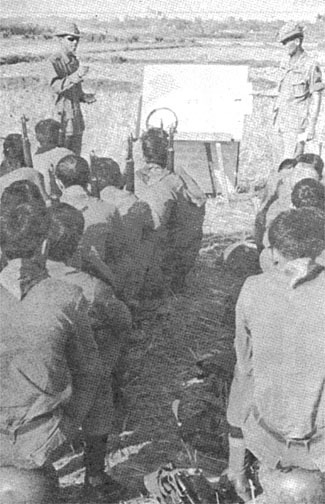 Two officers and 11 enlisted men from the 2nd Bde's 1st and 2nd Bns, 27th Inf, and the 1st Bn (Mech), 5th Inf, spend long hours in front of charts, blackboards and on rifle ranges to train the Vietnamese. The course is a rough cross between standard American basic and advanced individual training courses. The two principal areas are weaponry and general subjects. Subjects include instructions on the 81mm mortar; the 30-caliber and 50-caliber machine gun; the BAR, M-1 and carbine; the 45-caliber pistol and the 45-caliber submachine; the 57mm recoilless rifle and the M-79 grenade launcher. General subjects consist of map reading and land navigation, mines and booby traps, first aid, airmobile familiarization, field fortifications, patrolling, and offensive and defensive tactics from squad to company level. For a graduation exercise, the entire battalion conducts a three-day operation, including sweeps, reconnaissance in force and at least one day of airmobile combat assaults. HURDLING THE LANGUAGE BARRIER - SFC Fred Haskell, 1st Bn (Mech), 5th Inf, waits while an interpreter translates his marksmanship instruction. 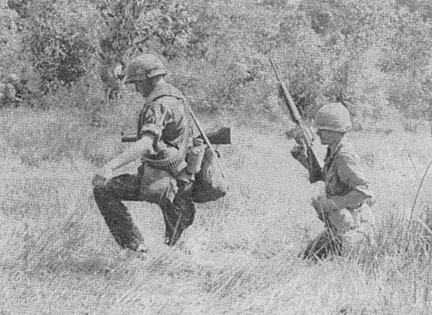 ON THE MARK - SGT Larry Cheeks of the "Wolfhounds" marks a good shot group during target practice for the 49th ARVN Regiment. 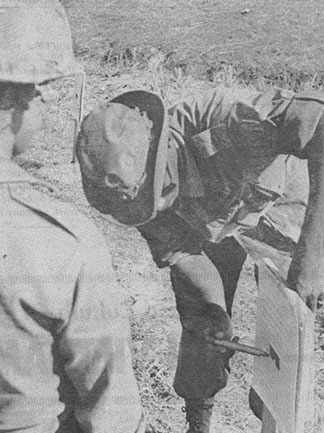 ON THE SPOT CORRECTION - SSG Silas Moses of the 2nd Bn, 27th Inf, helps a Vietnamese soldier get correct sight alignment on the M-79 grenade launcher. 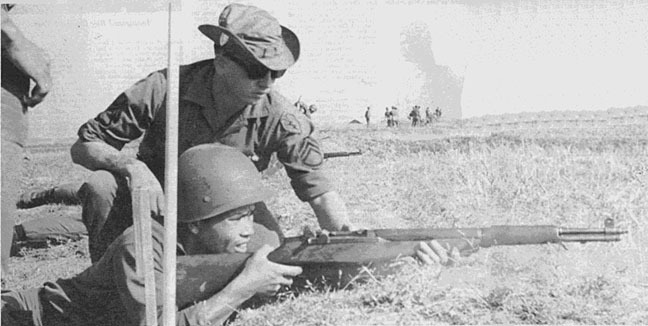 ON THE FIRING LINE - SSG Randolph Henderson of the 1st Bn (Mech), 5th Inf, points out proper firing techniques to a Vietnamese soldier learning to fire the M-1 rifle. 3RD BDE - Reconnaissance In Force east of Cu Chi brought on a strange battle for a unit of the 3rd Bde, 25th Inf Div. Alpha Co, 3rd Bn, 22nd Inf was about to search a VC bunker complex. Suddenly several Viet Cong in a large bunker opened up with a fierce hail of gunfire, pinning down the lead elements of the American company. Three soldiers were wounded, two fatally. When M-79 and small arms fire, plus fragmentation grenades failed to dislodge the enemy, the company pulled back. "They were really dug in there," commented CPT Herbert C. Chancey, "so we pulled back and called in an air strike." Several hours of bombing and strafing stopped most of the gunfire but an occasional sniper round snapped through the air. Cautiously the company moved up on the bunker and silenced the sniper. In all, five enemy were killed, two AK-47 rifles and an RPG rocket launcher were found inside the bunker. During an operation east of Cu Chi a unit of the 3rd Bde narrowly escaped being surrounded by a heavily armed Viet Cong force. Moving north through swampy terrain, Charlie Co, 3rd Bn, 22nd Inf discovered fresh food and other signs of enemy activity. Minutes later the Viet Cong opened fire on the lead elements with heavy automatic weapons and RPG fire. Withdrawing, the American company returned the enemy fire as they maneuvered away. Then the company commander, 1LT Charles J. Boyle called in three air strikes on the enemy force. 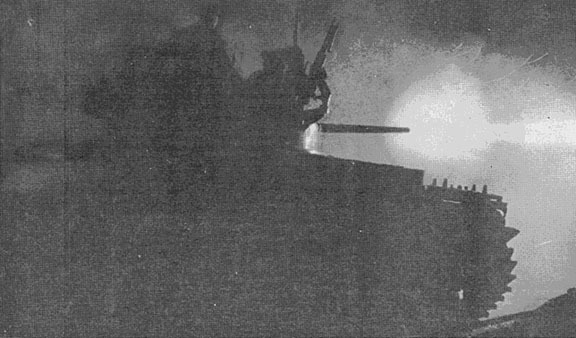 The troops continued to pour in fire on the VC as the jets and gunships pounded the bunkers. After the bombing the company moved back through the area and located 14 VC bodies. "When we discovered well over 50 bunkers with tunnels, it was obvious that this was a base camp for a large VC unit," commented Boyle. 3RD BDE - Recent fighting in the Saigon area brought the 3rd Bn, 22nd Inf into combat south of Cu Chi. 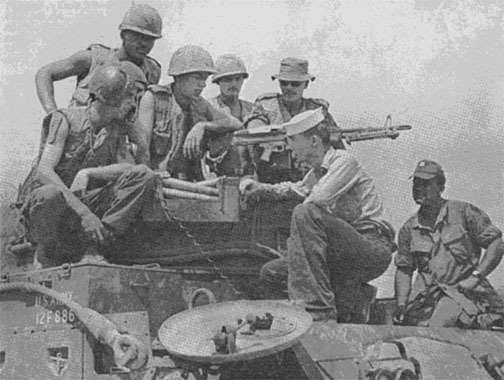 With several companies of Viet Cong headed for the village of Cu Chi, troops of the 3/22 were called in to assist the local ARVN forces in pushing back the enemy. Alpha, Bravo, and Charlie companies swept through the village, killing several VC infiltrators and taking 21 detainees. Delta Co accounted for 27 of the enemy dead in heavy fighting in and around the smaller villages near Cu Chi base camp. 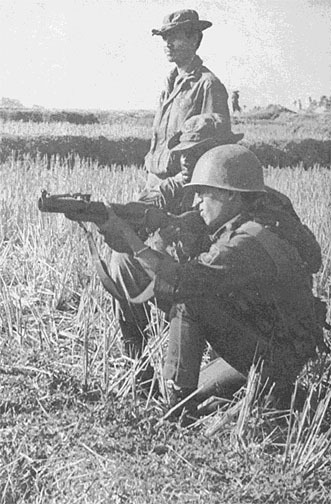 As the Viet Cong companies scattered throughout the area, the "Regular" troops conducted highly effective search and destroy missions among the dusty rice fields. Constant enemy fire from rockets and automatic weapons produced U.S. casualties, but the dispersed enemy paid a high price. In four days of fighting 55 enemy were killed. 3RD BDE - With his battalion engaged in heavy combat outside of Cu Chi, LTC Roy K. Flint recently assumed command of the 3rd, 22nd Inf. LTC Thomas U. Harrold, former battalion commander, was unable to return to Dau Tieng so the customary change of command ceremony was omitted. A native of St. Petersburg, Fla., Flint spent six months with USARV Headquarters prior to taking command of the "Regulars". 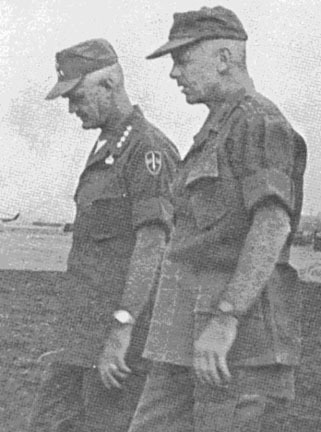 After a brief handshake ceremony with the former CO, Colonel Flint took to the air in an observation helicopter to direct his battalion in its fight against the Viet Cong. 3RD BDE - A recent Viet Cong attack on a unit of the 3rd Bde at Dau Tieng triggered a combined air and ground attack that resulted in 15 enemy dead. Advancing across open terrain east of Cu Chi, Alpha Co, 3rd Bn, 22nd Inf "Regulars" came under heavy fire from an estimated VC platoon. Reacting quickly, Capt Herbert C. Chancey, Alpha CO from Augusta, Ga. ordered a covering base of fire to support the withdrawal of the company so that tactical air and gunships could be called into the area of the intense enemy fire. Several hours later the company cautiously moved back into the bomb-torn VC base camp, immediately finding six enemy bodies. 2ND BDE - Water buffaloes and Viet Cong with flashlights make for restless nights, according to one 25th Inf Div rifleman. SP4 David B. Posey of Tallahassee, Fla., had moved halfway to his position on a listening post when he "bumped into something." As the 2nd Bn, 27th Inf "Wolfhound" reached out to see what it was, the "something" snorted. "It felt, it smelled, and it sounded like a water buffalo," he said, so Posey made a quick detour and continued on his way. "Then we passed a building and heard some mumbling, so we sent the interpreter inside to tell the people not to be afraid." 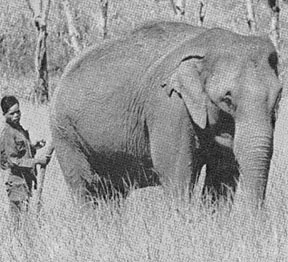 The interpreter cautiously entered the building, then left considerably faster: No people inside, just six water buffaloes. Soon after the listening post team reached its position, Viet Cong armed with flashlights harassed the men. At one point, Posey related, the light from one enemy nearly blinded him. "Later on, we spotted a man sneaking up on the position. We opened fire and next morning we found a blood trail," he said. "It was quite a nerve-wracking night," Posey sighed the next morning. Tay Ninh SGM Sees PO 3Class Learns "Army Doing OK Too"
1ST BDE - A long delayed reunion took place at the 25th Inf Div's 1st Bde Hqs in Tay Ninh as SGM David F. Curran and his son, Petty Officer 3rd Class William D. Curran, both from the Bronx, N.Y., were briefly reunited when young Curran took leave from his ship, the USS Coral Sea, and journeyed to visit his father who is the Tay Ninh Post sergeant major. The two men had been trying to see each other since March of 1967 when the "Top" departed for Vietnam. Petty Officer Curran was on his third and last cruise in the Gulf of Tonkin when he finally got the paperwork for his leave approved. Beaming proudly, "Dad" Curran shook his son's hand, and told him what a fine job the Navy was doing. Petty Officer Curran replied with a grin that the Army was doing OK too. 1ST BDE - SP4 John W. Hale and SGT Robert W. Hoffman are just two of many men who use the self service laundromat set up in War Zone C by the Heavy Mortar Platoon of the 2nd Bn, 14th Inf, during the 25th Inf Div's Operation Yellowstone. Hale, from Sherman, Tex., explained, "Because of the delay in getting our clothes back from our base camp at Tay Ninh, we decided to start our own laundry." Until some soap powder was found they used regular hand soap to wash their uniforms. "Our fatigues didn't come out as clean as they did at the Quartermaster laundry," said Hoffman from Oakland, Calif., "but at least we had a regular change of clothes." An artillery ammo canister is used to wash the clothes in, and a small plastic wash basin serves as a rinse pan. Communications wire stretched between two bunkers is used as a clothes line. "Our biggest problem is spotting the incoming helicopters before the strong downdraft from their rotors hits the laundry area," remarked Hale. "If we see a chopper coming, everybody runs over and grabs their wash before it blows away." 1ST BDE - The 3rd Plt of B Co, 2nd Bn, 14th Inf, 25th Inf Div captured two ox carts on a reconnaissance in force operation near the Cambodian border, and are putting their unusual "cache" to use by hauling supplies on them at their forward base camp in Katum, 112 kms north of Saigon. Sweeping through the jungles, the Infantrymen came upon a network of roads and trails. "We knew that the Viet Cong were using ox carts in the area because we could see the deep ruts that the wheels had made," said SP4 Stanley A. Stull of Stockton, Calif. Beside one of the trails the tongue of a cart was seen sticking out from under its protective camouflage, and pulling off the net, the men found two carts beneath it. The carts were in good condition, so the GI's decided to tow them back to camp. "We often have to move heavy loads and since we don't have any wheelbarrows we figured we'd use the carts," stated PFC Michael E. Sheedy of Elizabeth, N.J. Seeing a half-dozen men pulling an ox cart load of mess gear, barbed wire, or even passengers is a common sight at Katum. 1ST BDE - The 39 men assigned to the Heavy Mortar Plt of the 2nd Bn, 14th Inf, have developed the ultimate in jungle living conditions only 8 kms from the Cambodian border, and have done so through the use of expended ammo boxes from fire missions conducted during the first stage of Operation Yellowstone. After heliborning into the bamboo thickets in Dec, the men wasted no time getting their village started. The 1st Bde was extremely busy and it was the 4.2 inch mortars' responsibility to supply their brigade with plenty of fire power. The "Four Deuce" section, a more common name for the big mortars, is on alert 24 hours a day and can be called on to support its battalion in any direction. It is not an easy job to man the mortar tubes, it takes a great deal of accuracy and skill. The platoon fired a total of 13,000 rounds during the first month at Katum, leaving 6,500 empty boxes to be disposed of. The normal procedure had been to destroy or burn the major portion of the expended boxes; however, the mortarmen decided the pine boxes could be put to many uses in the improvement of both their comfort and protection. For an entire month, the 39 men combined their "American ingenuity" and built what is now known as "Katum's Hawaiian Village." The unique thing about their accomplishment has been the fact that they built the village entirely during their spare time. After two rounds were expended, the box was filled with dirt. The boxes were then placed on the walls of the bunkers to provide protection in the event of an enemy mortar attack. Round after round was fired and box after box was filled until a virtual fortress was constructed. The outside wasn't the end of the ammo boxes uses; floors, wall paneling, shelves, tables, squad gun cabinets and bunks were also constructed. 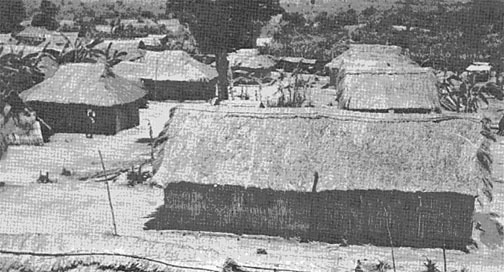 The village, which is almost completed, is composed of six major hootches. Four house the mortar squads, another serves as living quarters for the administrative group and another is the Fire Direction Center, where targets are plotted. The mortar tubes are just outside the door and a round is only as far as a radio call away. The men stand ready to aid their battalion on its continued success against the enemy. Between fire missions, the members of Hawaii's own 25th Inf Div continue to improve and enjoy their version of "Katum's Hawaiian Village." 2ND BDE - A daring enemy attempt to sabotage a vital bridge 18 kms northwest of Saigon failed recently when a 25th Inf Div medic spotted a head bobbing in a canal. PFC Brandy Slone of Pippa Passes, N.Y., a medic with Alpha Co, 1st Bn, 27th Inf "Wolfhounds" spotted the head underneath the Hoc Mon Bridge. That structure spans a large canal which intersects Highway 1 running from Saigon north past the division Cu Chi base camp to Tay Ninh. At the same time, other members of the company opened fire on seven enemy outside their defensive perimeter around the bridge. According to PSG Salvatore F. Pesta, leader of the company's third platoon, his men could not fire because friendly positions were on the other side of the bridge. Pesta, of Jonestown, Pa., shouted for the other platoon to move out of the way, then ordered his men to start pitching hand grenades into the canal. SP4 Coy Adkins of Oplira, Ala., jumped into the water to clear the area, and discovered a large object tied to one of the bridge's supports. SSG Arthur Collins, the second platoon leader, replaced Adkins in the canal and discovered the "object" to be a 40-lb satchel charge. The Easton, Kan., native called for a knife, then began feeling slowly for a firing device. "At this time," Pesta recounted, "I asked Collins if he knew what he was doing." "I hope so," Collins replied. "He asked again for a knife," Pesta continued. "I guess I looked kind of surprised and informed him it was in his hand. Then he cut the fuse and brought the charge out of the water." 1ST BDE - "I really couldn't believe my eyes . . . all the Viet Cong were wearing white bobby socks," remarked SGT Dave Robbins of Tracy, Minn. "They looked like a basketball team taking the court." The 12 white-footed enemy were spotted by Alpha Co., 4th Bn, 9th Inf, in War Zone C, 95 kms north-northwest of Saigon. The 25th Inf Div unit had set up an ambush along a foot path often used by the Viet Cong. When the VC moved into the American position, the company opened up with claymore mines and small arms killing all 12. "We don't know why they were wearing the white socks, but it sure made them easier targets," recalled SGT Paul Johanovich of St. Louis, Mo. "And we really socked it to them." 1. I extend my personal congratulations and convey as well the official commendation of the Military Assistance Command, Vietnam, to men and women of the command for outstanding professional performance during the period of the enemy's Tet truce aggression beginning 29 January 1968. 2. Your alertness, aggressiveness, professionalism, and courage - individually, by team, and by unit - add new luster to your outstanding reputation. During one week, in conjunction with the forces of the Republic of Vietnam and our Free World Allies, you have blunted the enemy's offensive and turned the tables on him. You have destroyed more of the enemy in seven days than the United States has lost in the seven years of the war since 1 January 1961. 3. I know you share my respect for the admirable performance of our Vietnamese and Free World comrades in arms in this mutual triumph. We are proud to fight side-by-side with such allies. 4. But we cannot relax for a moment. We must continue to stand ready for the enemy's possible second wave attack. As you maintain your resolute alert for what may come next and go on the offensive, again let me assure you of my profound pride in your conduct and performance and my confidence that the defeats we are inflicting on the enemy may measurably shorten the war." ©2007 25th Infantry Division Association. All rights reserved.